A photo of Bord na Móna apprentices taken at Athlone RTC around 1973 or 1974. A hirsute bunch - We got this from Michael Kenny who works in Derrrygreenagh workshop. Michael is second from the right front row. 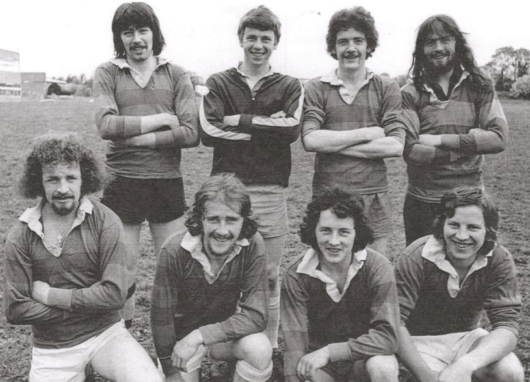 The names we have are back left Gerry Murtagh (RIP), second from right Paddy Dooley and possibly Eamon Hogan at the end. We can only name Michael Kenny in the first row. If anybody knows the other names please let us know. Paddy Dooley hurled with Kildare and Wexford and played football for Moorefield in Newbridge. The late Gerry Murtagh played football for Ballymore in Westmeath. Another memory from the past, a good photo, all very happy looking.